An international research group improved perovskite solar cells efficiency by using materials with better light absorption properties. For the first time, researchers used silicon nanoparticles. Such nanoparticles can trap light of a broad range of wavelengths near the cell active layer. The particles themselves don't absorb light and don't interact with other elements of the battery, thus maintaining its stability. The research was published in Advanced Optical Materials. Perovskite solar cells have become very popular over the last few years. This hybrid material allows scientists to create inexpensive, efficient, and easy to use solar cells. The only problem is that the thickness of a perovskite layer should not exceed several hundred nanometers, but at the same time a thin perovskite absorbs less amount of incident photons from the Sun. "Dielectric particles don't absorb light, so they don't heat up. They are chemically inert and don't affect the stability of the battery. Besides, being highly resonant, such particles can absorb more light of a wide range of wavelengths. Due to special layout characteristics, they don't damage the structure of the cells. These advantages allowed us to enhance cells efficiency up to almost 19%. 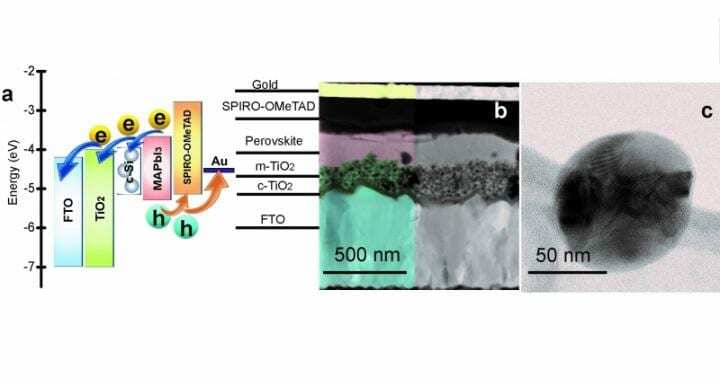 So far, this is the best known result for this particular perovskite material with incorporated nanoparticles," shares Aleksandra Furasova, a postgraduate student at ITMO's Faculty of Physics and Engineering. According to the scientists, this is the first research on using silicon nanoparticles for enhancing light harvesting properties of the absorbing upper layer. Silicon nanoparticles have already surpassed plasmonic ones. The scientists hope that a deeper study of the interaction between nanoparticles and light, as well as their application in perovskite solar cells will lead to even better results. "In our research, we used MAPbI3 perovskite, which allowed us to study in detail how resonant silicon nanoparticles affect perovskites solar cells. Now we can further try to use such particles for other types of perovskites with increased efficiency and stability. Apart from that, the nanoparticles themselves can be modified in order to enhance their optical and transport properties. It is important to note that silicon nanoparticles are very inexpensive and easy to produce. Therefore, this method can be easily incorporated in the process of solar cells production," commented Sergey Makarov, head of ITMO's Laboratory of Hybrid Nanophotonics and Optoelectronics. "Resonant Silicon Nanoparticles for Enhanced Light Harvesting in Halide Perovskite Solar Cells". Aleksandra Furasova et al.